Did you know that herbs contain powerful anti-cancer protection? Using herbs for cancer prevention and treatment is by no means a novel, modern or alternative practice. Herbs have been used in the treatment of cancer for many, many years and the constituent chemicals of plants have been the starting point for research and the creation of many modern medicines. However, today’s post will be on reaping the benefits from common garden herbs. Herbs are nature’s medicine cabinet. So whether you grow your own or stop at the local farmers market, eat them daily for a powerful anti-cancer boost. Rosemary. The two key ingredients in rosemary, caffeic acid and rosemarinic acid, are potent antioxidant and anti-inflammatory agents, which help protect the body’s cells from damage by free radicals. Rosemary has been found to detoxify substances that can initiate the breast-cancer process and it stimulates liver enzymes which inactivate estrogen hormones. Rosemary can inhibit the formation of HCAS, the carcinogenic compounds that form when you cook protein. Cilantro helps to remove heavy metals like Mercury from the body. Mint has anti-bacterial, anti-inflammatory properties, helps prevent damage from radiation, and it cuts off the blood supply to tumors.. and may protect your liver too. Parsley has potent anti-inflammatory and anticancer abilities. The phytochemicals in parsley can slow the speed of cell division, leaving time for the cell to correct DNA mistakes and activate apoptosis, and recent research shows that one particular compound, apigenin, found in celery, artichokes and herbs such as parsley may well be the key agent for killing breast and pancreatic cancer cells. Basil has powerful anti-inflammatory and antioxidant properties. It contains flavonoids that help shield cell structures from radiation and oxidative damage, and may protect liver cells. Both fresh basil and basil oil have strong antibacterial capabilities, so by adding the herb or oil to your salad, you can help ensure your vegetables are safe to eat. Oregano possesses anti-bacterial as well as anti-inflammatory properties, and encourages cell death making it a powerful anti-cancer herb; but what is really exciting is that may be particularly effective against prostate cancer and may even become part of the treatment for this cancer. Thyme possesses terpenoids which are recognized for their cancer preventive properties. Rosmarinic and ursolic acids are major terpenoids in thyme that possess anti-cancer properties. Thyme contains an essential oil that is rich in thymol, a powerful antiseptic, antibacterial, and a strong antioxidant. In my house we eat a lot of tabouleh. Tabouleh, tabouli, no matter how you say or spell it, is both delicious and good for you. What I love about it too is that it is versatile; for as many ways there are to spell it, there are just as many ways to make it. 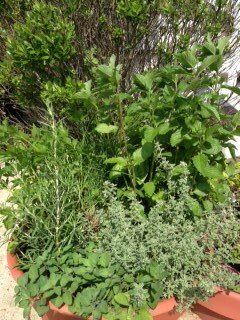 For this I head to the farmers market as I put A LOT of herbs in mine, far more than I can grow in my small garden. Keep in mind that ideally, the salad should be green with specks of white, but make it whatever way you prefer. Pour boiling water over bulgur wheat and salt. Cover wheat for 30 minutes and let sit on the counter. Stir in lemon juice and oil, chill for 2-3 hours. Add chopped herbs, and other ingredients of your choice and toss gently, adding more oil as desired. I add chickpeas to make this salad a meal. You can also substitute quinoa in this recipe. For quinoa, bring 1 cup quinoa (rinsed well), ½ tsp salt and 1¼ cups water to a boil over high heat. Reduce heat to medium-low, cover, and simmer until tender, about 10 minutes. Remove from heat and let stand, covered, for 5 minutes. Fluff with a fork. If you want, you can spread the quinoa out on a large rimmed platter or baking sheet; let cool. Transfer to a bowl and mix in the lemon juice and oil, then the remaining ingredients. I love to marinate chicken, turkey, fish, zucchini and eggplant in olive oil and rosemary, and oregano and chicken are great together too. Thyme is delicious on eggs. Dill is fantastic on cucumbers, fish and zucchini. Basil, well who doesn’t like basil and fresh ripe tomatoes? Add some onion too! And don’t forget pesto; make some with basil or try cilantro (or spinach, kale, or arugula); use them on grilled foods, spread them on your sandwich. Fighting cancer never tasted so good…oh, do I love summer. Like these tips? Join me on my radio show, Survive and Live Well, for tips to treat and beat cancer. Join me weekly as we chat with the experts about treatment options and lifestyle choices that can help you not just treat cancer, but beat cancer, survive, thrive and live well. At the end of each show I give my cancer fighting tip of the day, so tune in Tuesdays at 1pm, EST. Elyn Jacobs is a breast cancer survivor, professional cancer coach, radio talk show host, speaker, and the Executive Director for the Emerald Heart Cancer Foundation. Elyn empowers women to choose the path for treatment that best fits their own individual needs. She is passionate about helping others move forward into a life of health and wellbeing. Elyn lives in New York with her husband and two young boys. To learn about Elyn’s coaching services, please visit: https://elynjacobs.wordpress.com. To tune into the Survive and Live Well radio show, please visit www.W4CS.com, Tuesdays at 1pm (EST). To view info on upcoming topics and guests, please visit: https://elynjacobs.wordpress.com/elyns-blog/. Elyn! Thanks so much. I am on my way to the grocery store and will happily stock up on your suggested herbs. I knew about rosemary – actually used it in a pasta dish last night. It’s also terrific in lemonade! This is a great blog post and an important Grocery List for ladies who are looking to eat their way to less risk. Thanks again. And happy shopping, ladies.